The 1 million trees reported by Ron Boone of Burchell Nursery, is already enough to produce approximately 20 million lbs. of almonds per season when these trees reach maturity. 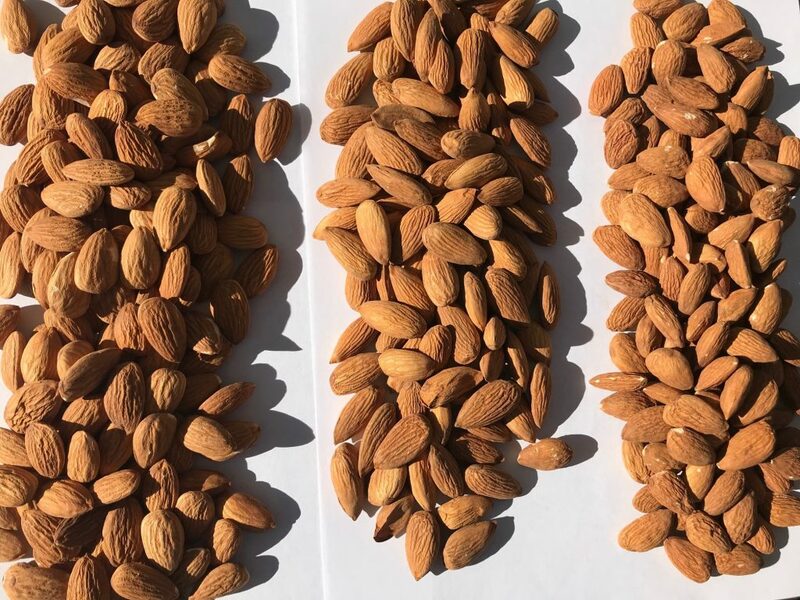 Traditionally, almond growers plant multiple rows of different varieties so bees can cross pollinate and set a crop. The increasingly popular self compatible varieties like Independence and Shasta do not require multiple varieties as flowers from the same variety can pollinate each other. RPAC anticipates receiving the first limited commercial quantities with the 2018 crop and see large acreage going in this winter. As we have not received more than samples, we defer to Burchell, the nursery, for quality info. They report inshell crack-outs of 60-65% with a well sealed, semi-soft shell, and large sized kernels that blanch well. 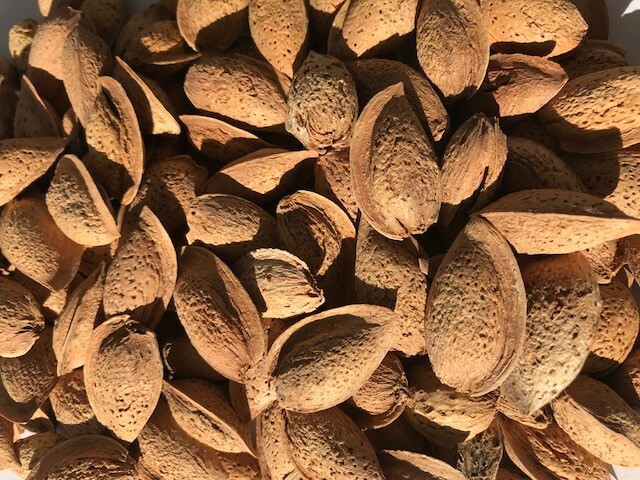 Self compatible almonds appeal to growers for many reasons starting with bloom and the cost savings associated with lower bee requirements. With a single variety, harvest becomes more efficient and allow for less stress of the trees. There is potential for additional efficiency savings with with spray applications, irrigations, and more. Growers report Shasta comes off the tree very easily, making for a clean shake. Shaking has been one of the challenges with Independence due to its tendency to grow on the scaffolds like we see with Wood Colony. Burchell notes the Shasta tree is medium size, somewhat vigorous, with a shape of semi-upright to spreading. Growers tell us they are satisfied with the tree’s vigor, size and shape. 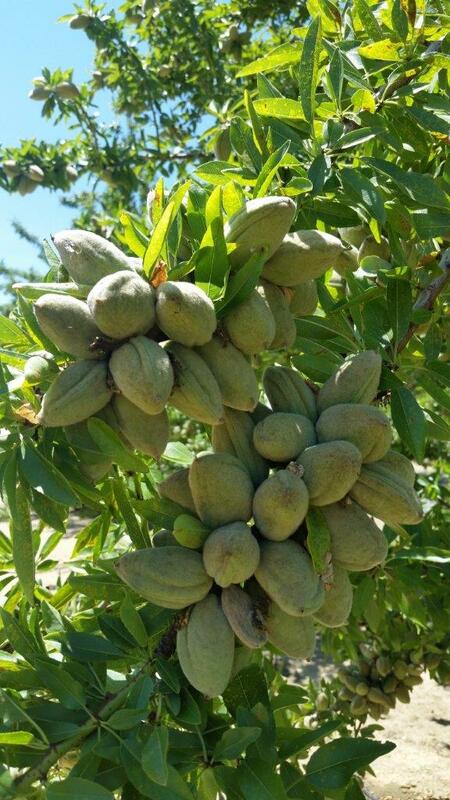 In a nearby trial orchard, we have noticed large clusters of almonds like those pictured here. Harvest timing is reportedly with or slightly ahead of Nonpareil. 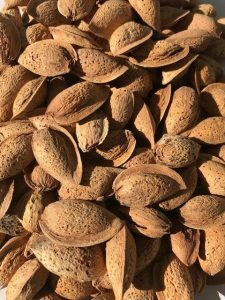 Another advantage of both Independence and Shasta over traditional blocks is the ability to finish further ahead of the potential rainy season toward the later part of almond harvest. As more of these early harvest varieties reach maturity, there is concern about having enough harvest equipment to handle so much at one time. The latest nursery report (April 2017) showed 2016 new plantings were made-up of: 37% Nonpareil, 25% Independence, 17% Monterey, 4 to 5% each of Wood Colony, Aldrich, and Butte. Shasta had not hit the radar yet. The self compatible varieties seem to be taking place of traditional pollinators such as Carmel, Price, Fritz, and Butte/Padre, as Nonpareil is holding its percentage of the acreage. If planting Shasta with another variety such as Nonpareil, we recommend planting them in separate rows. Please feel free to contact us for further information.